Our regular players must have heard my prayers over the past two weeks, because we’ve got a complex situation tonight. Our returning champ is a fellow Brooklynite; she played strong in her first two games, but is trailing by 800 heading into Final tonight. Susan, in third, could play spoiler – or Karen or Andy or both could keep her locked out. If Karen doubles her score, she’ll have 21,200. 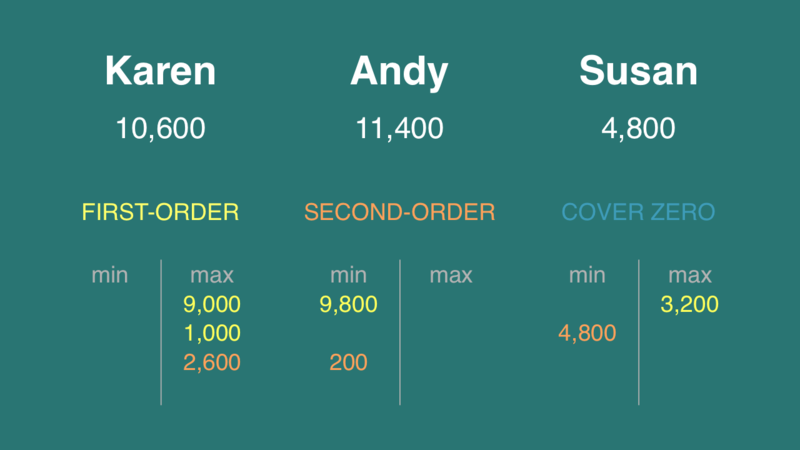 To cover this all-in wager, Andy will need to wager 9,800. 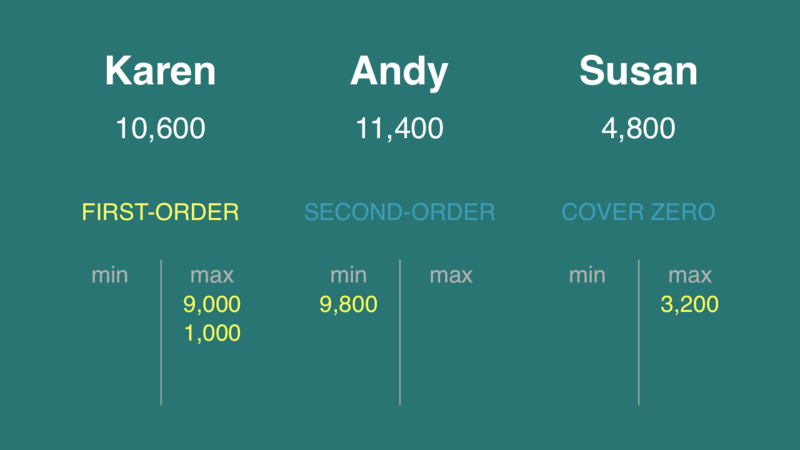 An incorrect response with that wager will leave Andy with 1,600. To stay above his total, Karen can wager up to 9,000. Susan can wager up to 3,200. A successful doubling will put Susan at 9,600. To stay above her, Karen can wager at most 1,000. Karen can wager so as to stay above Susan and cover a zero wager by Andy. Therefore, this is a Shore’s Conjecture situation. This happens to be the Strong Form. If Karen chooses to stay above a double-up by Susan, she will have at most 11,600. Andy can cover that with a wager of 200. Karen and Andy are so close that if Andy wants to go big, he might as well go for the lockout. Even if he misses with something smaller, he’ll fall below both of his opponents. Should Susan wager 3,200, she’ll have 8,000; Karen can stay above this with a wager of 2,600. If Susan is afraid of this, she could wager everything, although she’d have to take Karen for a very savvy wagerer. Karen should wager at least 800 in case Andy wagers nothing. 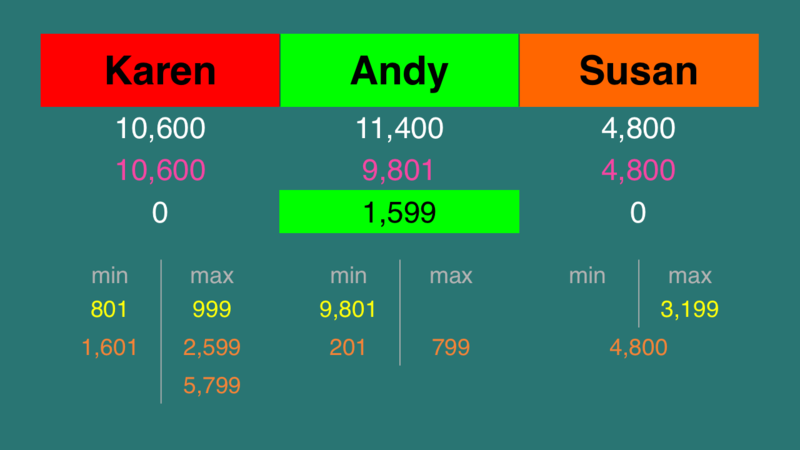 Andy could put the ball in Karen’s court by capping his wager at 800 – a so-called Colbyesque or Brakhagesque wager. Karen should account for this by wagering at least 1,600 on her somewhat-larger conservative range. Yikes, Karen! 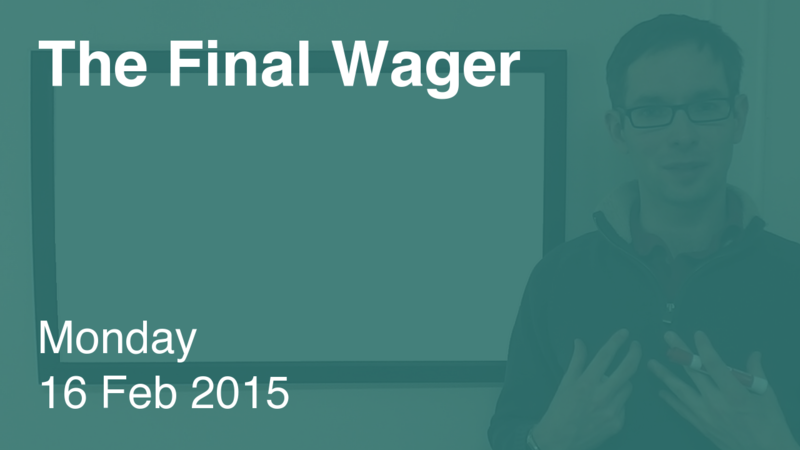 There’s no reasonable wager from Andy such that an all-in bet makes sense. I don’t really like Susan’s wager, either, but I can understand a player would rather risk falling to zero than to lose a game for not wagering enough (for example, if Karen wagered 2,000). $1,599 is tied for the tenth-lowest winning regular score in the post-KJ era – and that game had co-champs. Andy won less than second place, yes, but he does get to return tomorrow, and as such is guaranteed at least $1,000 more. And did I mention he gets to return tomorrow? All players were in the lead except for Christine, Mike, and Lanny, with Christine in third going into FJ! in her game. I concur. Thanks for posting that! To update, Dava-Leigh Brush should be in between Mike and Lanny with 1,500 dollar wins. Anyone else having issues with this site in mobile? Desktop version looks great but mobile on Chrome is half white. You’re not the only one. I’m working on it – sorry for the issue. This is a minor nitpick, but you don’t need to add or subtract a dollar from half of those wagers. Basically, every wager can be described as having even or odd parity. Maximum wagers, zero wagers, and wagers in reaction to odd parity wagers are all of even parity, and don’t need to be plus or minus a dollar. Any wager made in reaction to even parity wagers are of odd parity, and do require the extra (or missing) dollar. Although I could understand if it’s easier to always add or subtract the dollar than to figure out whether it is or isn’t necessary. The two most “basic” wagers, zero or all-in, are of even parity and the dollar should be added when covering the amount, or subtracted when staying above it (making such a wager odd-parity). This includes covering a trailer’s double-up, covering a leader’s zero bet, staying above a player whom you have a lock over, and the maximum “Colby-esque” wager from the leader. A wager in reaction to a bet designed to cover or stay above a zero or all-in is of even parity and does NOT need to have the dollar added or subtracted. 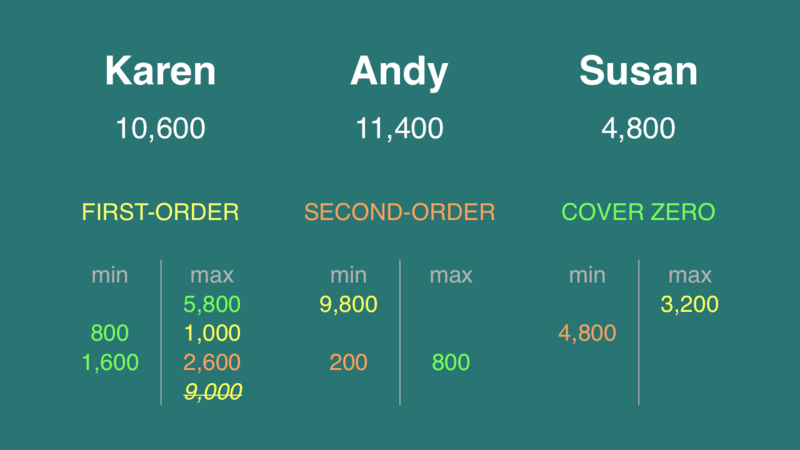 Common examples are the maximum a trailer can bet to stay above a leader’s cover bet if wrong (or the absolute minimum to bet in a crush game), the minimum needed to cover an “unsafe” wager, a “Shoretegic” wager from the leader, etc. If a player decides to wager in reaction to a bet in the above paragraph (another level into mind games) then it’s again of odd parity and +/- $1 should be done (for example a leader playing mind games against a trailer’s wager that assumes a cover bet). Essentially in “mind game” scenarios you alternate between “odd parity” levels that require the dollar to be considered and “even parity” levels that don’t. *Exceptions may apply in applicable “wager-to-tie” scenarios in which you or another player has an incentive to bet for a particular exact amount. Guys, I think we’re losing the forest for the trees here. Remember my original target audience: people who hate math. This system allows for both (1) straightforward addition and subtraction with round numbers, and (2) prevention of ties where relevant. If a tie wager is present, it will be reflected in both columns. Removing the dollar from all maximum wagers has another benefit: it defends against the off chance the leader forgets to tack on the extra dollar. While I’m sure we could label many minute facets of wagering, I’m unconvinced the time is worth the dollar.